Q. Comment on the sleep-walking Scene in Macbeth and discuss how it focuses on the character of Lady Macbeth. Ans. Though the plot of Macbeth is dominated by Macbeth, the importance of Lady Macbeth in the gradual transformation in plot construction cannot be put aside. Except, Macbeth she is the most acclaimed character in this play. She shares her husband’s lust for power. Her fierce goading leads Macbeth to commit regicide and seize the throne. Realising the horrible consequence of his misdeeds, Macbeth divulges his anguish in his soliloquy in Act-v, Sc-v, and makes a tragic appeal to the audience. But Lady Macbeth finds a concentrated expression for her agony and claims sympathy from the audience in only one scene, that is Act-v, Sc-I. This is the so called sleep walking scene where we find a Lady Macbeth faint with the trembling flame of a candle, completely different from the graceful queen who with her firmness and strength at once controls the guest and her frightened husband in a royal banquet in Act-III, Sc-IV. In this scene her total mental break down suggests her inability to handle the evil which she deliberately invoked to choose. Before sleep-walking scene we lastly see Lady Macbeth in the Banquet scene where her boldness does not give any hint of her impending breakdown. She loves her husband deeply and wants to assist him and appease his mental unease. But since the murder of Duncan Lady Macbeth becomes increasingly unimportant to her husband as begins to go emotional collapse that constitutes the main plot. Due to the increasing detachment from him and all the ghastliness and unnaturalness of her crime, she loses her balance of her mind. Her progressive weakness of mind is expressed in her utterance: “Nought’s had all spent/ Where our desire is not without content” (Act-III, Sc-II). Her desolation sinks inward and from this state of nervous exhaustion and lonely brooding, sleep-walking is a possible and natural happening. 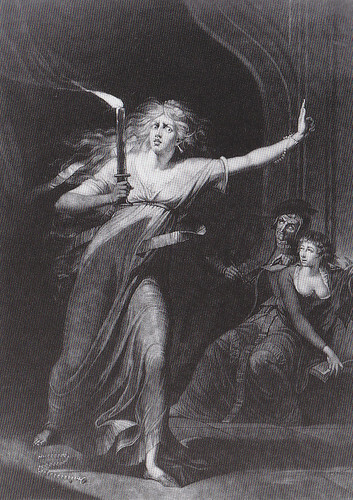 The sickness of Lady Macbeth is vividly suggested by her perpetual longing for light as she is afraid of darkness which is associated with hell: “Out damned spot...Hell is murky”. But it was she invoked the dark night: “Come thick night/ And pall thee with the dunnest smoke of hell” (I, IV). But now “she has light by her continually”. At the moment of murder she encouraged Macbeth saying, “A little water clears us of this deed”. But now the smell of blood haunts her mind. She says, “All perfumes of Arabia will sweeten this little hand”. She said defiantly, “What’s done is done.” But now she regrets, “What’s done cannot be undone”. The sharp contrast between her previous and later speeches brings to the fore the dramatic irony of the play.